The latest novel from the Age of Sigmar series is out to coincide with the Disciples of Tzeentch book. Besides just featuring the new Tzeentch baddies, this is also our first book with a regular mortal Freeguild member as our protagonist, in fact, the Stormcast are barely in it. Alongside the Freeguild we also get to see the Scourge Privateers and a particularly determined Witch Hunter. First off, this is a pretty short and quick novel, but very well written and very enjoyable! Instead of being divided up into chapters like a book normally is, City of Secrets is divided up into three parts like a play. The novel opens up on a unit of Freeguild who are tasked with patrolling the city, which is pretty much an average night for them. This is one of the cities established amongst the Mortal Realms after the events of the Season of War campaign this past summer. We are introduced to all of the different members, who are just complaining about their jobs like normal people do. Something I was pleased to see is that this was a mixed gender unit, meaning that at least some of the armies of the Mortal Realms don't conform to that medieval standard of only men. After you have become invested in all of them they are all promptly killed except for their leader, of course. Their normal leader was too drunk to perform his duties that night, so instead Armand Callis takes charge and leads the unit on patrol. Normally they avoid certain areas of the city due to them being too dangerous, but Callis decides to take them through the Veins, a bunch of criss crossing alleys in the poorer section of the city, because, well, thats what they are supposed to do. Unfortunately they stumble upon two suspicious gentlemen who turn out to be Freeguild members themselves who are transporting some illegal prophecy orbs. This city, Excelsis, has a strange spire floating above it that can grant prophecies and glimpses of the future, but it's heavily regulated by the city itself. Once the illicit material is unveiled an ambush is launched and they entire loyal Freeguild unit is killed except for Callis, who manages to barely escape with his life and knowledge of the potential treachery brewing in his own city. He also accidentally receives one of these prophecies which gives him a glimpse of what the future holds for the city, and it doesn't look good. Now a wanted man, since the traitorous Freeguild members framed him as the one who killed everyone, he finds himself before a Witch Hunter of the Order of Azyr. These sound a lot like Inquisitors in 40k, and I'm sure that's what they were going for. Instead of killing him or turning him into the authorities though he takes Callis into his protection, saving him from a group of Kairic Acolytes out to kill him. From there the story spirals through levels of deceit, betrayal, and resistance as the Witch Hunter, Toll, and Callis fight to stop the city from falling to the machinations of Tzeentch. I can't really talk much more about the plot without giving away the rest of the book, but it's all a fun read and reaches a suitably dramatic and explosive climax. The best part about this novel though is how it explores the areas and peoples of the Mortal Realms we haven't really seen before. The majority of the Stormcast posted to the city were drawn out into the wilds to fight a growing orruk threat, leaving the Freeguild as the only real protection. There are a few Stormcast left in the city, but they mostly keep to themselves until things get really heated, believing this to be a matter below their concern until the last moment. I also really like how the Stormcast are viewed by the mortals under their protection. They are seen as horrible avenging angles of Sigmar, something that you should treat with carefully lest you bite off more then you can chew. In fact, there is a great scene where Toll and Callis go to petition the remaining Stormcast for aide that really ramps up the tension between the allies. Besides just exploring the human Freeguild, we also get to see a Duardin companion to the Witch Hunter and a sizable force of Scourge Privateers, who are called on to repay an old debt. I believe this is the first time we have seen any Aelves in the novels besides Alarille. The only thing I wanted more of was exploration of the Tzeentch Acolyte forces. We never see much from their perspective and instead they are just treated as the bad guys. For a majority of the book they are fairly un-Tzeentchy too, instead being portrayed by mostly traitor Freeguild and city officials. I guess that would be fairly accurate, and they do throw off their "disguises" for the final battle and go full Tzeentch, but it would have been nice to see some more esoteric stuff from them early on. Shadowy meetings of secret cabals and all. I really like the new Tzeentch stuff, especially the Kairic Acolytes, so I just wanted to see them utilized more. I hope a future story featuring them does a bit more from their point of view because I think there is a lot of material to mine there. 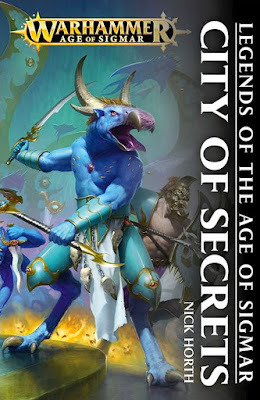 City of Secrets is a definite change of pace from past AoS novels, which have more or less all focused on the Stormcasts' invasion of the Mortal Realms. Now the cities are starting to flourish, and along with that more varied and mortal forces. This is what a lot of people have been asking for and now you can finally get a little peek into how the average people of AoS function in their day to day while still maintaining the high fantasy feel of the setting. The city of Excelsis definitely has a very high fantasy feel to it, but for most of the humans who live there that's all above their heads while they are just trying to scratch out a living. We even get a glimpse at potential rivalries and prejudices between the humans who came from Azyr to repopulate the lands and the humans who were already living there. For example, Callis is a descendant of the natives of Ghur, while a lot of the others in his unit are from Azyr, which plays into the suspicion cast on him after his unit is killed. As I mentioned earlier, it's also nice to see the Freeguild expand past their roots laid in the Empire of the Old World. The ranks are filled with both men and woman, of a multitude of races and skin colors. Callis himself is described as having darker skin and I for one definitely welcome this change in pace. I would recommend picking this up if you're a fan of AoS and definitely if you have been waiting for more of an exploration into how the average people and cities of AoS look and function. Based off of the previews we have heard of other forthcoming books I expect we will only see more of this as further cities, races, and armies are explored and fleshed out. I don't doubt we will also continue to get Stormcast centric books, but I think it will be more of an even spread between them and the other forces of Order. If you're a fan of Freeguild, Scourge Privateers, Tzeentch (including all the new stuff like Tzaangors), darker and more menacing Stormcast, and cities of the Mortal Realms, then this book is most definitely for you! This is also the first novel by Nick Horth, who works in GW's background lore department, and I think it was a great first book and I look forward to more from him in the future. OPINION: What Constitutes a "Filth" List in AoS?